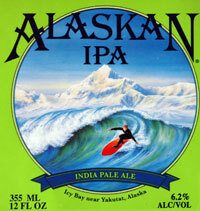 Alaskan Brewing celebrates its 21st birthday by releasing Alaskan IPA, a beer that takes inspiraton from the surfing culture in Yakutat, Alaska. Outside magazine named Yakutat “one of the five best surf towns in America.” The label shows a surfer with 18,000-foot high Mount Saint Elias in the background. Jack Endicott of Icy Waves Surf Shop in Yakutat said surfing in the remote coastal communit us unlike surfing anwhere else in the world. He told a story of watching two of his sons surfing in 25-degree temperatures, with snow falling so hard to lost sight of them. “I’ll never forget standing on the beach and watching the steam rise from their heads after they removed their hoods,” he said. The new IPA has 2.5 pounds of hops per barrels. The beer begins with fruity and citrus aromas, blending with pine character and some candy-like sweetness. Biscuit melds with more hop (almost woody) flavor in a medium body, sliding into a bracing dry finish. Wolaver said he has been trying to find more local organic farmers to grow grain for the brewery. – United States Beverage touts the beers from Barons Brewing as the first Australian craft beers available in the United States. These include Black Wattle Wattle Seed Ale, Barons Pale Ale, Barons Superior Lager, and Barons Extra Special Bitter.